Spring has arrived, which means it’s the perfect time to give your lawn some extra TLC. During the winter you might have experienced heavy rain or frequent frost, and you’ll have been mowing less often. All of these things can leave your lawn looking tired. The good news is that there are some simple steps you can take to bring the green freshness back into your lawn, making it healthier and stronger, as well as increasing it’s drought and shade tolerance ready for the summer months. By ensuring your lawn is in good health, you’ll be naturally combatting weed problems too. 1. 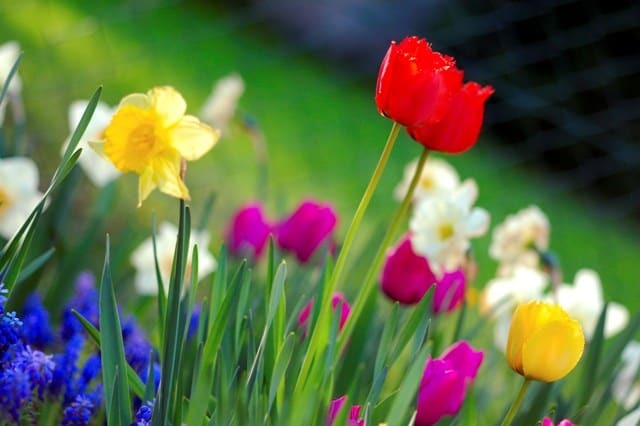 Fertilize: Spring is an ideal time to fertilize. Rake the lawn first, to clear away any debris and to separate the grass blades. Make sure that you give the lawn a good, even coating. Follow the instructions on the packaging, and remember to water your lawn thoroughly after applying fertilizer to stop it from ‘burning’ the lawn. The combination of fertilizer and warm spring weather will probably mean that you’ll be mowing more frequently over the coming weeks, as it starts to grow rapidly, but this is actually good for the lawn. It will kick start lawn growth for the summer and before long, you’ll notice the deep green colour coming back. 2. Top Dressing: will fix any unevenness in your lawn, and can also help to restore lawn that’s in really poor condition after the winter. Mow first and then use a quality sandy loam soil (your local garden centre can advise) and spread the loam soil evenly over the lawn, ensuring not to cover the leaf tips – you should be able to see the lawn peering through the soil. Don’t water for 2-3 days (Ideally, you should top dress in a good run of dry weather to make sure you don’t get rained on, too!). 3. De-thatching: When gardeners talk about ‘thatch’, they’re referring to the layer of brown coloured organic matter that lies between the top green layer of the lawn and the soil bed. This layer is comprised of runners, lawn clippings and other plant matter that’s in the process of breaking down. A layer of thatch is necessary in a healthy lawn because it provides insulation to the root system, preventing evaporation of water and vital nutrients. Thatch is also what gives lawn it’s cushioning, making it soft to walk and play on, but too much ‘sponginess’ can be an important indicator that it is time to de-thatch. Thatch can get thick when lawns are not mowed frequently enough and sometimes it just occurs on its own. However, too much thatch not only makes your lawn look ugly, it can severely damage your lawn – once the green tips of the grass are gone photosynthesis stops and the lawn has no food source. If this occurs, then you need to vertimow the lawn, a process that is sometimes called scarifying. This is a difficult job and it is recommended that you get help from a professional. But if you follow a regular lawn maintenance programme throughout the year, with special attention to the needs of your lawn in each season, then it will stay in good shape all year around.